FRAMED PRINT. 22x18 inch (56x46cm) Framed Print with Black Satin with Off-White Digital Mat. Artwork depicting JANE LEWSON (116). 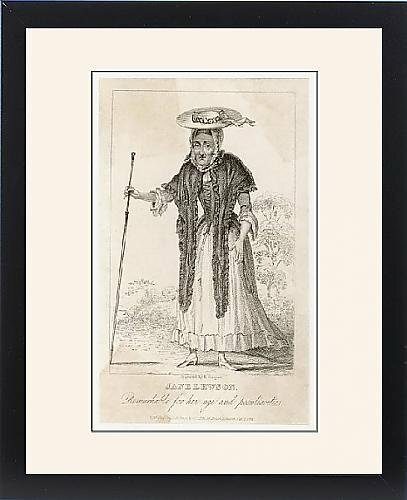 JANE LEWSON a London widow as renowned for her eccentricities as her age, such as a belief that washing in water is unhealthy she used pig s lard instead. Professionally made to order in the USA. Artwork Description... JANE LEWSON a London widow as renowned for her eccentricities as her age, such as a belief that washing in water is unhealthy she used pig s lard instead.